Above is a new poster that I've created for the Buxton Fringe Festival. I've had this love of poster art for many a year, and creating my own, for our Dr Sketchys (amongst other events) is just one of my favourite things to do. Some of the artists I adore the most are those who making posters way back when; Toulouse Lautrec, Mucha are just Gods to me. with that in mind, I had this idea of making a series of posters where I pay homage to these heroes of mine. Obviously there's no improving on their works, but just perhaps, doing my own cover version. 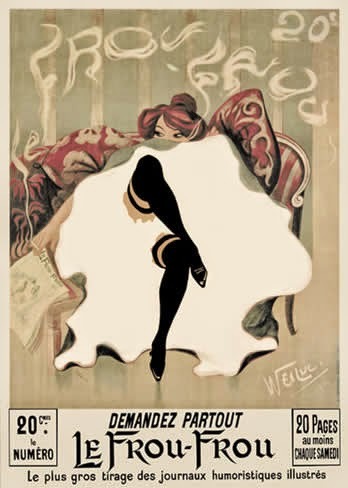 So I started with this beauty, below, Le Frou Frou by Lucien Henri Weiluc. Damn, it's gorgeous. You can see more of my poster artwork HERE. Here's a drawing that I made on a pubcrawl sketchcrawl that we, at Sketchcrawl North, did last year. I made it in my large Moleskine - the kind that has an A3 size double page spread. Increasingly, I've found that I really enjoy drawing on a bigger scale. Maybe it's a reaction to all those years of drawing tiny things in tiny books. I don't know. But, this is a biggie for me. Unfortunately, I don't have a scanner that can take this size page which is why it's taken so long to post it. 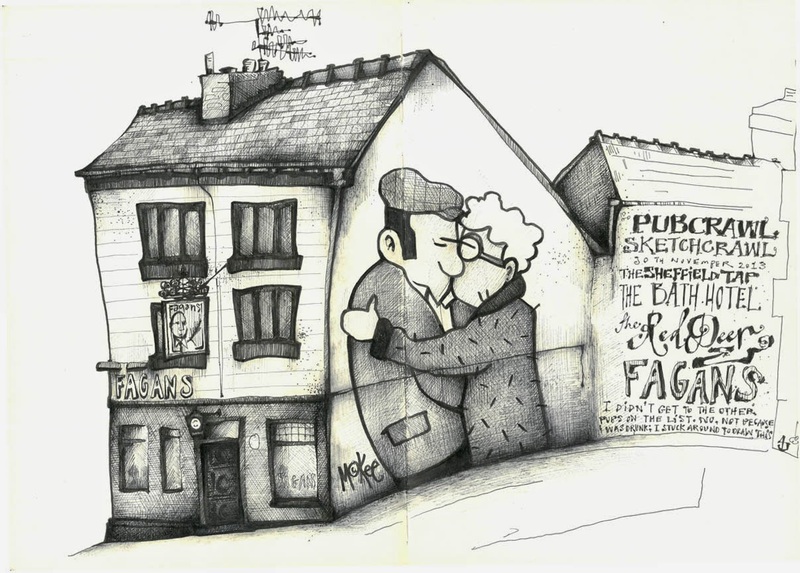 It's a drawing of a pub in Sheffield, called Fagans (obviously), that has this beautiful, and very British, mural by Sheff's own Pete McKee. I've wanted to draw this for ages and last November I braved the cold and finally did it. Now that I see it on screen I realise that it needs something more. I know exactly what it is it needs, so it may just get a bit more AJ treatment. In fact, it definitely WILL. So, here's Part One. More to come. You know when a project takes over your life? Yeah? Well, that's exactly what has happened here. 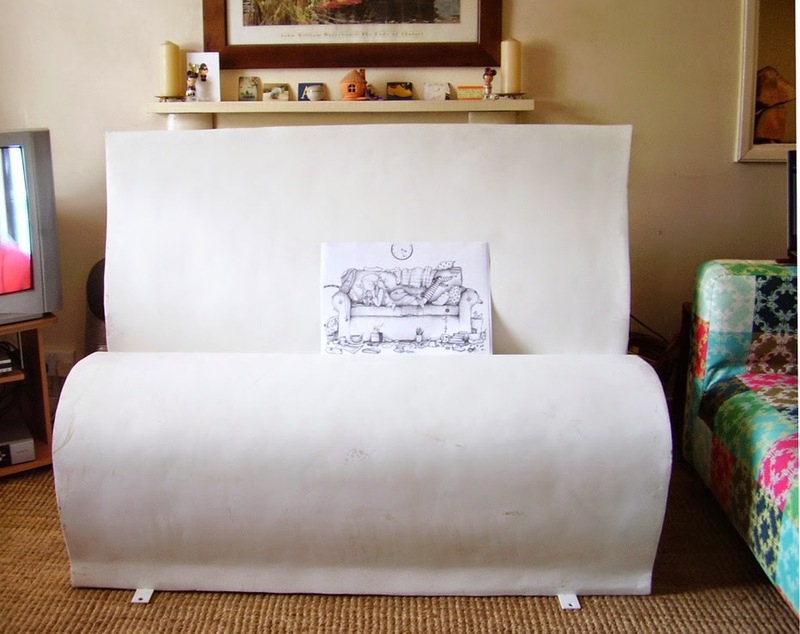 Here's an update on the Books About Town / Wild In Art book bench project that I am working on. 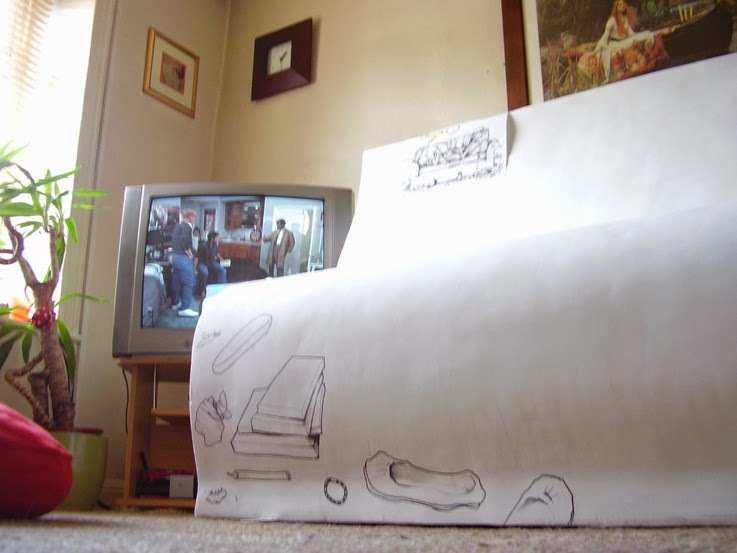 Last time, I posted about it, I had just received this giant open book that has now become part of the furniture in my living room. 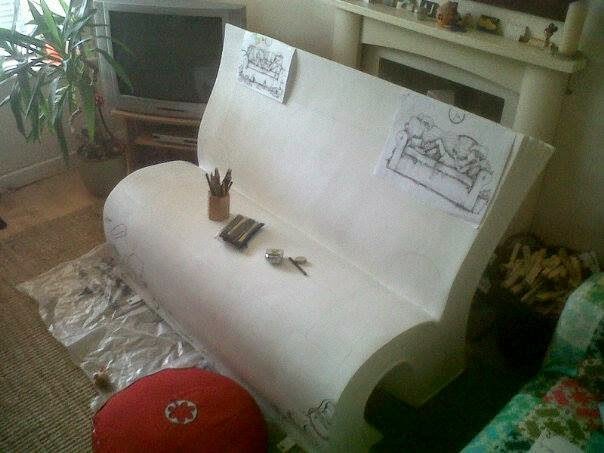 Stage 1 was to prime the bench. 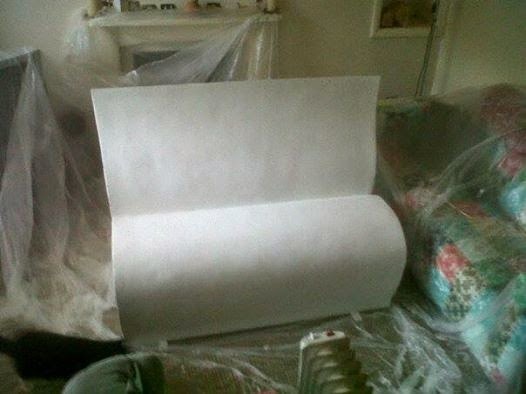 I wanted a clean white background for my drawing - so a friend came around to help with that. That friend was not Dexter, despite it looking that way from the photo above. We just got over enthusiastic with the dust sheets. That was the easy bit. 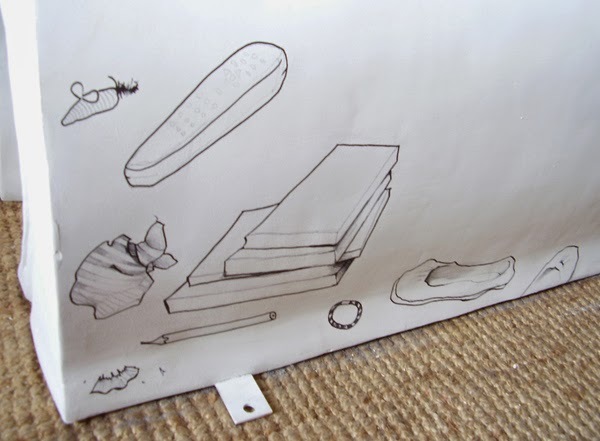 Stage 2 is to transfer my drawings, which I originally made on A4 paper (20 x 30cm ish) onto the bench. 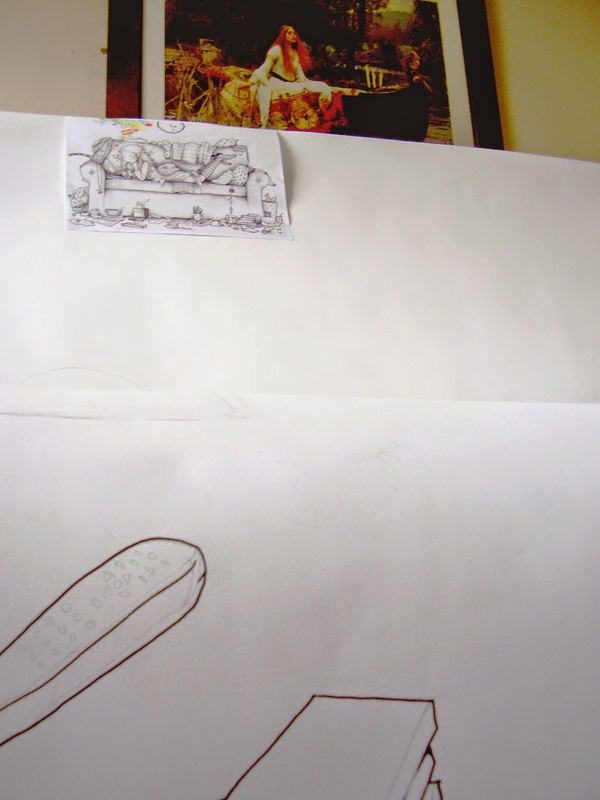 It's not just enlarging the drawing, to such a scale, that's difficult. No. 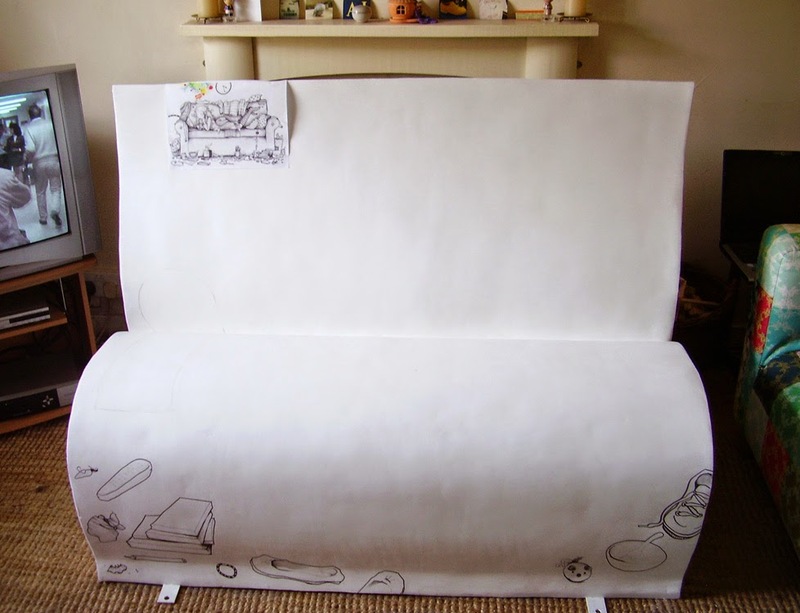 It's that the bench is not a flat piece of paper. Working the drawing around all the curves is tricky. But, I've started. And, I did so whilst watching back to back Columbo over this Easter weekend. Many people have said that this must be a daunting task. People often talk about the fear of drawing in a new sketchbook. The fear of the blank page. And, this is such a large blank page. But, I've never had the issue. In fact, I'm quite the opposite I love starting a new sketchbook with all the possibilities that brings. Procrastination is my issue. 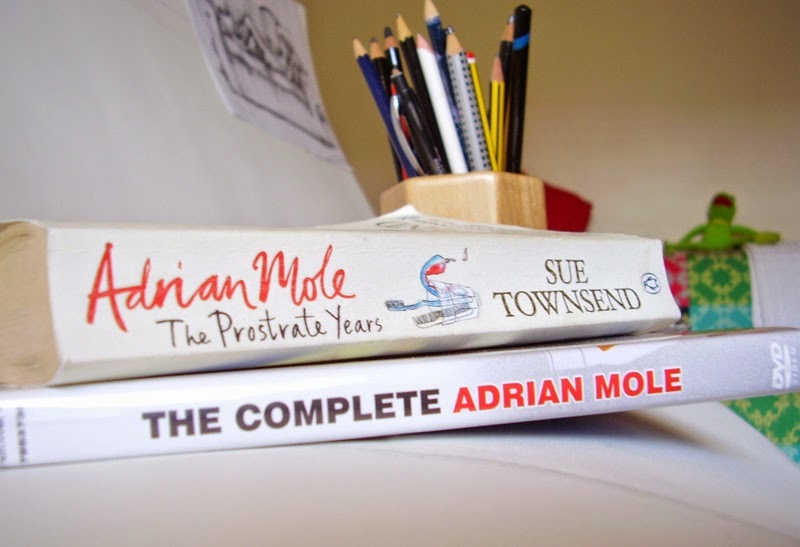 So, I'm pleased that I've got going, whilst being watched over, and inspired by, my ladies over the bench; the Lady of Shalott; my teenage self; and, of course, Sue Townsend whose recent death has made choosing her Adrian Mole book as my theme for the bench even more poignant. It also fills me with pride to be honoured to pay tribute to her, and Adrian, in this way. Nice of Dexter to come and help paint the bench.